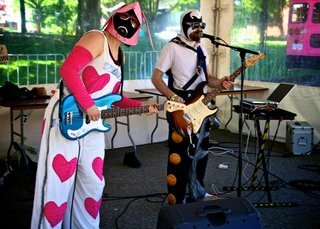 Baboon Torture Division is a Canadian guitar/bass duo who play along with a computer. Masked superhero and lead singer, Steve Biloba, plays guitar and Pocketron XP plays bass in a gas mask. They are currently working on their 11th album and playing shows around the pacific northwest. Frequent guest band members include Ronald Reagan, Ronald McRonald, a bear and the monopoly guy.